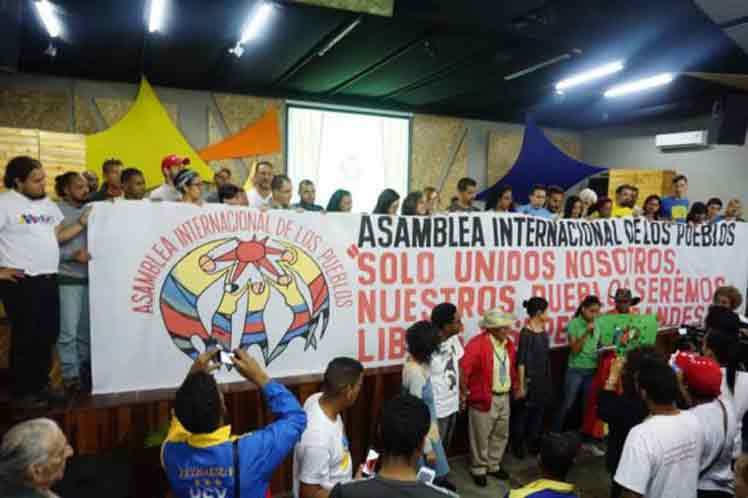 THE INTERNATIONAL PEOPLES ASSEMBLY WAS HELD IN CARACAS FROM THE 24 TO 27 FEBRUARY THIS YEAR. It brought together over 400 leading activists, politicians, academics, journalists and other leading personalities from across the globe. 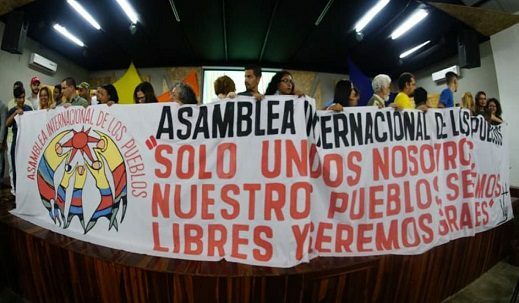 Assembled together in Caracas, Bolivarian Republic of Venezuela, between February 24 and 27, 2019, delegates from more than 90 countries from the five continents, representing social and political organisations and movements reaffirm our defence of the sovereignty and self-determination of Venezuela, we pronounce ourselves in defence of the Bolivarian Revolution and the legitimate and constitutional President, Nicolás Maduro. During the last two decades, the Bolivarian Revolution is moving forward in a process and project of deep transformation, based on participatory and protagonist democracy, focused on peoples interests, which has communal organization and aims the feminist socialism proposed by Hugo Chávez. With this perspective, it has produced changes in the horizon that also involve the construction of a multi-centre and multipolar world, with important changes in the neo-colonial relations that affect our region and the South. 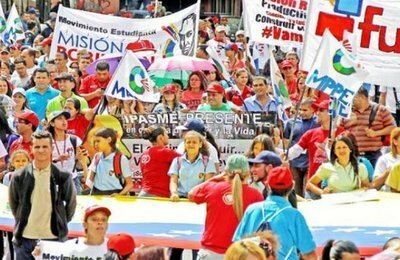 With a vision of redistribution of wealth that comes from the plentiful resources that the country produces, Venezuela has attained unprecedented results in its history with universal access to public and free education, eradicating illiteracy and allowing unprecedented access to higher education. Similar achievements are registered in health, housing and other social rights. US imperialism, guardian of the corporate, financing, military and transnational interests it embraces, is determined to bring the process down in order to take direct control of the natural resources. To give an end to the proposal of sovereignty and self-determination, the United States has unleashed all hybrid and permanent war strategies; it has tried all possible tactics: coups, terrorism, financial speculation, economic blockade, induced inflation, among others. Since 2008, there is a clear structural, multidimensional, and historical crisis of capitalism; in this context, the United States seeks to maintain its world hegemony by all means, including war, which results in aggression, invasions and wars to seize natural wealth, and control the markets, the territories and the governments. In this sense, the geo-economic dispute with China and Russia threatens to lead humanity towards a total war. Thus, in order to protect free market and the freedom of corporations to plunder and exploit our peoples, in various parts of the world, they are moving forward with economic pressures, such as the blockade against Venezuela, Cuba and Iran, and war aggressions, as those in Iraq, Afghanistan, Libya, Yemen, the Democratic Republic of the Congo; and land occupations such as Palestine. They also impose economic, psychological, and cultural wars, such as the one that has been violating Venezuela for several years. Paradoxically, it is the “defence of human rights and democracy” that has served as a crutch to camouflage the most serious collective aggressions. But the peoples resist and have managed to stop these attempts of control as it was the situation in Crimea and Syria. The imposition of the rules of the game of corporate and globalized capitalism can only be sustained by eliminating democratic possibilities and rights of the working class, spreading chaos, destruction and death. Therefore, we reject the escalation of pressure from the United States government, such as the military action that, disguised as “humanitarian aid”, advances against the Bolivarian Republic of Venezuela. This is a new phase of the war that seeks to reinstate a model of political subordination, which can be seen in the aim of overthrowing the elected president Nicolás Maduro. 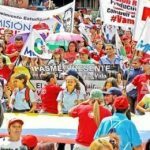 A new moment of this interventionist plan is now expressed in the external pressures promoted by ad hoc bodies, such as the so-called Lima group, which, coordinated with sectors of the Venezuelan far right, seeks to establishing an authoritarian coup d’état ignoring Venezuelan democratic institutions. We note with surprise that even institutions, such as the European Union, succumb to US pressures and, contrary to international law and democracy, proceed to recognize a self-proclaimed “president”, who no one has elected. This is supported by an ideological and communicational engineering based on the dissemination of fake news and fictitious scenarios, which are positioned both through corporate media and digital networks. The International Peoples Assembly in session in Caracas. To stop the economic blockade that leads to the suffering of the people, threatens the economic and productive project and the redistributive policies, and which has already cost Venezuela more than 30 million dollars. To defend sovereignty, participatory and protagonist democracy and the Venezuelan right to organize its economic project and manage its natural resources with based on sovereign criteria. The peoples of the world want peace; we do not want another war. Latin America and the Caribbean are peaceful territories, as it has been declared by CELAC in 2014, and as it needs to be projected into the future. Venezuela has the right to solve any difference through dialog and the multiple mechanisms provided by its own constitution and within the framework of the public international law. 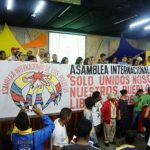 The peoples of the world, represented by the International Peoples’ Assembly, defend the Bolivarian Revolution as a project that provides a sense of ethics and future for humanity. We call the entire world to raise its voice to build on peace and stop the war. 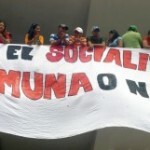 Caracas, February 27, 2019 – International Peoples Assembly – Mar 4th 2019. 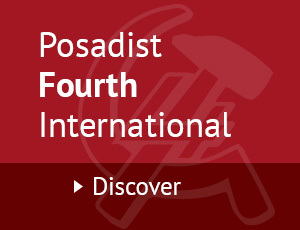 The Posadiststoday.com publish the above Manifesto in answer to its call to the entire world to raise its voice. The Posadists Today say: let us organise to defeat neo-colonialism, rampant malevolence and war! Forward to the International of Humanity!